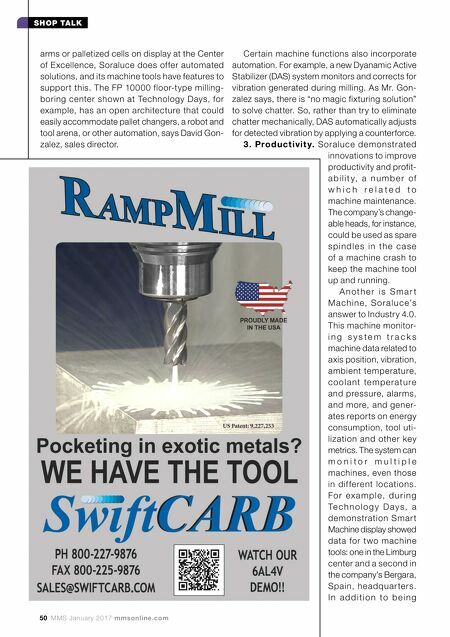 50 MMS January 2017 mmsonline.com SHOP TALK Certain machine functions also incorporate automation. For example, a new Dyanamic Active Stabilizer (DAS) system monitors and corrects for vibration generated during milling. As Mr. Gon- zalez says, there is "no magic fixturing solution" to solve chatter. So, rather than try to eliminate chatter mechanically, DAS automatically adjusts for detected vibration by applying a counterforce. 3 . Pr od u c t i v i t y. Soraluce demonstrated innovations to improve productivity and profit- a b i l i t y, a n u m b e r o f w h i c h r e l a t e d t o machine maintenance. The company's change- able heads, for instance, could be used as spare s p i n d l e s i n t h e c a s e of a machine crash to keep the machine tool up and running. 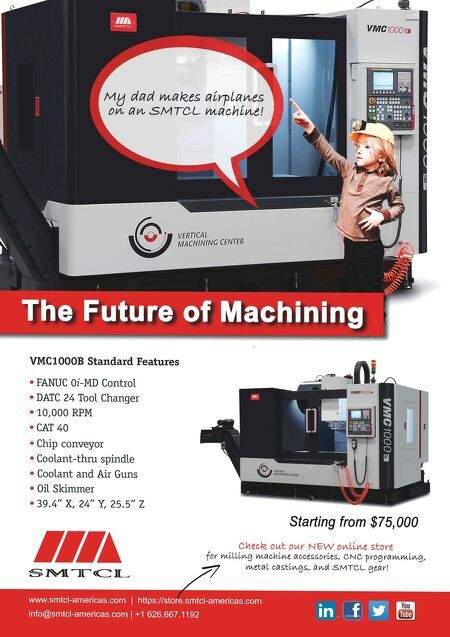 A n o t h e r i s S m a r t M a c h i n e, S o r a l u c e's answer to Industry 4.0. This machine monitor- i n g s y s t e m t r a c k s machine data related to axis position, vibration, ambient temperature, c o o l a n t te m p e r a t u r e and pressure, alarms, and more, and gener- ates reports on energy consumption, tool uti- lization and other key metrics. The system can m o n i t o r m u l t i p l e machines, even those in dif ferent locations. F o r e x a m p l e, d u r i n g Te c h n o l o g y D a y s , a demonstration Smar t Machine display showed data for t wo machine tools: one in the Limburg center and a second in the company's Bergara, Spain, headquar ters. I n a d d i t i o n t o b e i n g arms or palletized cells on display at the Center of Excellence, Soraluce does offer automated solutions, and its machine tools have features to support this. The FP 10000 floor-type milling- boring center shown at Technology Days, for example, has an open architecture that could easily accommodate pallet changers, a robot and tool arena, or other automation, says David Gon- zalez, sales director.